“I didn’t quite like the place, there is something so artificial about it all”, I quipped on my very second day at Singapore. In the moment that I forgot about my staunch travel manifesto – do not criticise any place, instead experience it all – I also managed to upset a few people. Even though the damage was already done, I instantly felt guilty on having uttered those words. Yes, it is a city that is completely man made over reclaimed land but I was soon to learn that this is exactly what makes Singapore stand apart. In its nascent 50 years of history, the nation-city went from being a third world country to South-East Asia’s financial hub. In the days that followed and till the day of my departure, not much of my impression changed, but a single experience one evening has made all the difference to this visit. Winding cobbled roads leading deeper into the park. Having researched on the city before travelling, I already had a list of places that I wanted to visit. 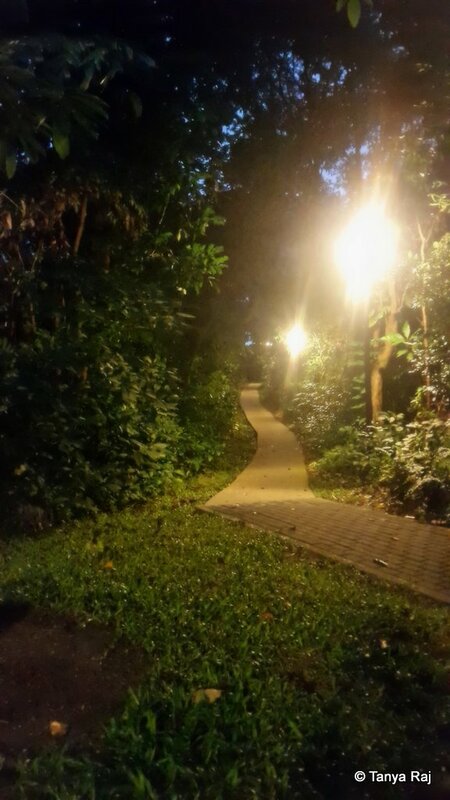 This particular place was on the top of my agenda – a 10 kilometre trek called The Southern Ridges that connects Mount Faber Park, Telok Blangah Hill Park, Kent Ridge Park, Hort Park and Labrador Nature Reserve. Not many locals seem to be aware of this hiking trail and I was met with “This is in Singapore?” questions on mentioning this to my friends who reside there. So one evening, when the sun started to get low and temperatures became somewhat bearable, my friend and I took a taxi and headed to Henderson Waves Bridge. We both had no idea of the exact location and tried our level best to explain to the driver about where we wanted to go. 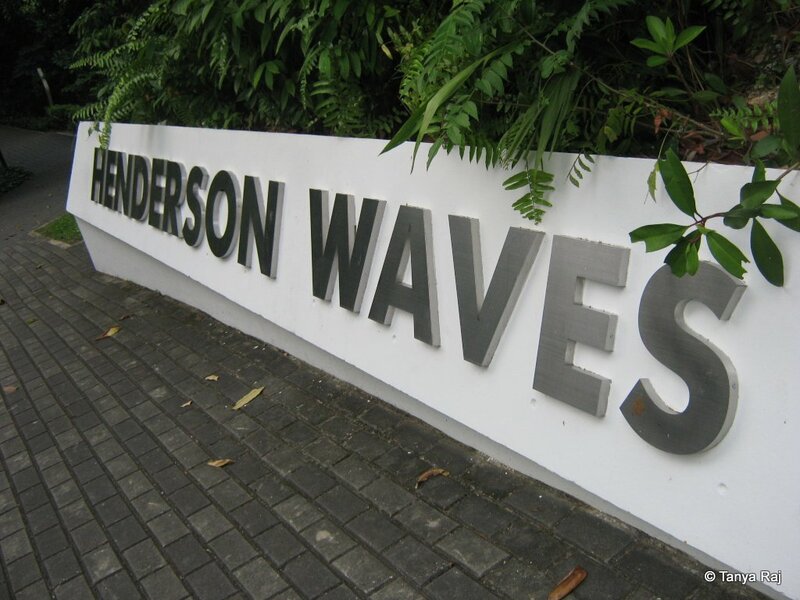 “To the Henderson Waves Bridge, please”. The stout Malay driver turned to give us a quizzical look. Certainly the name did not ring a bell with him. “Southern Ridges?” and we are met with another look from the deep probing eyes. “Which area?” he finally asks. My friend and I look at each other and respond “Not sure, but there is this bridge in the shape of waves. It gets all lit up during evenings.” Another 15 minutes of vivid descriptions from the pictures I had seen of the place, got us no luck either. He starts the vehicle and says, “No idea of this place. You put on maps?” Finally we remember the good old google maps and hurriedly enter the location. After about a few seconds of calculating the route, the app informs us that we are on the right way. 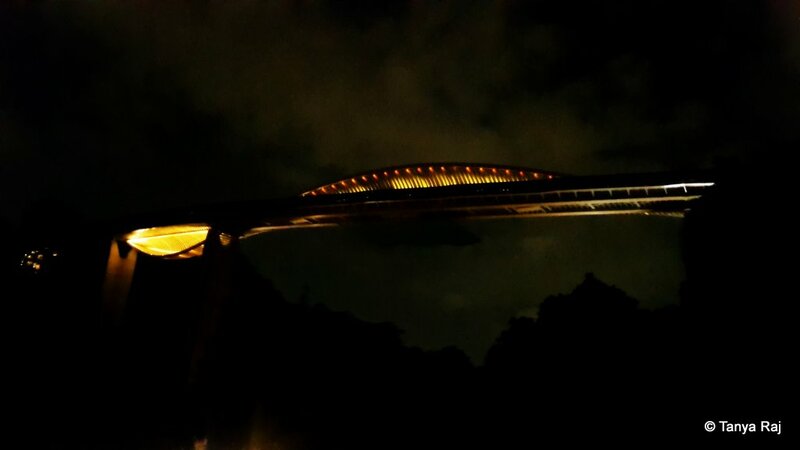 The bridge as seen from the Henderson Road at Telok Blangah Hill Park bus stop. We obviously had no intention whatsoever to hike the whole 10 kilometres, so we got down at the Telok Blangah Hill Park bus stop. Above us stood the Waves Bridge and next to the small green shed of the bus stop, a flight of 45-50 steps leads us up to the park. Winding roads along the jutting rocks covered with trees and shrubs on the right side and a view of the skyscrapers on the left are a dichotomy. The slightly inclined neat tar road in front of us has practically no humans and no traffic. Smaller cobbled roads jut out of the main walkway and seem to lead into the deeper parts of the park. The sun is now almost touching the horizon and the street lights come on. 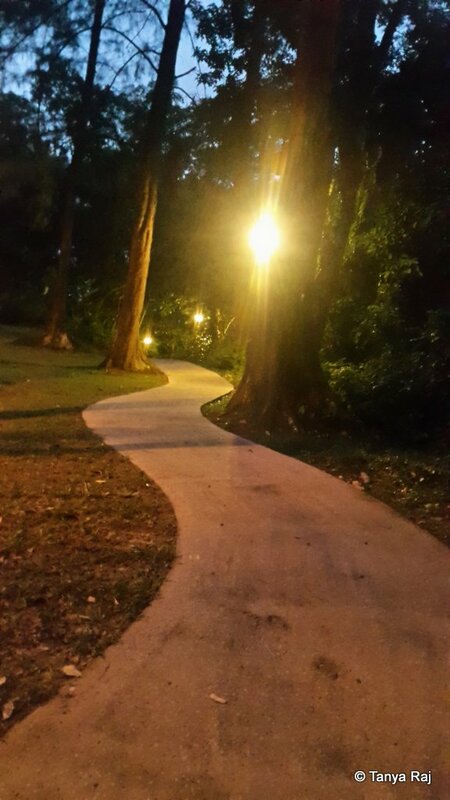 We start walking towards the peak of Mount Faber. A runner passes us by in a sunshine yellow jacket. After walking for about 500 meters we come upon a bend and turn left. Street lights fill the void of the sunlight in this tranquil piece of landscape. 300 meters ahead of us lay a dead end. On the right, we see a manicured bus stop with vines hanging down the roof and sides. Towards the left, the ridge landscape suddenly drops. 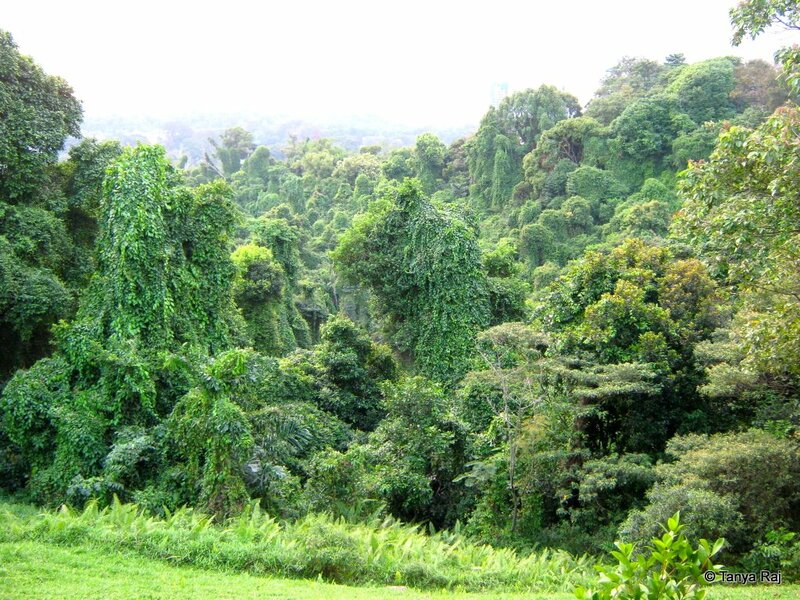 The 3 kilometres expanse is covered in dense green foliage which leads to the ocean. Beyond that, the view settles on the Sentosa cluster of islands. Opposite the bus stop a set of 15-20 rainbow coloured steps lead us up to a chic open air café – Faber Bistro. The ridge landscape suddenly drops and the 3 kilometres expanse in front of us is covered in dense green foliage which leads to the ocean. 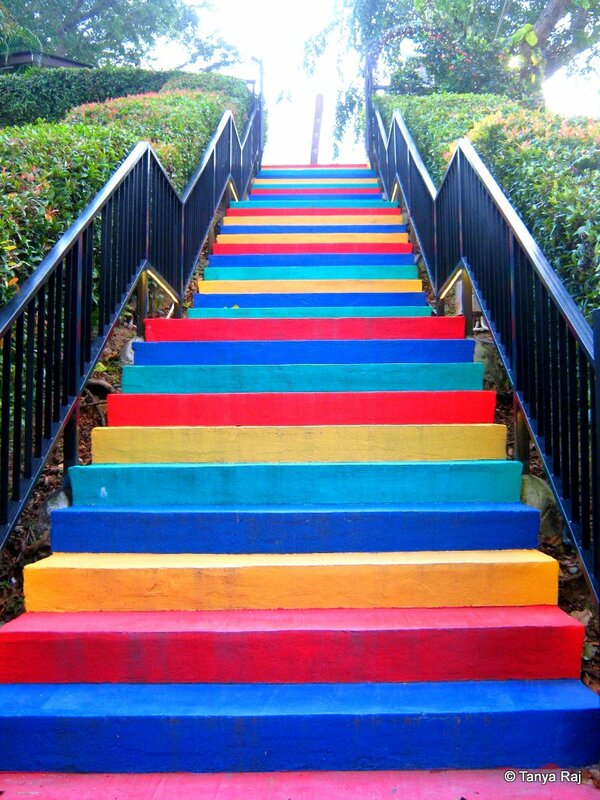 The rainbow coloured steps opposite the final bus stop on Mount Faber. Towards the left is an elongated pond filled with Koi fishes in orange, black, red and white. Right next to the landing of the staircase stands an arch covered in fairy lights and tiny bells, with a large iron bell hanging from the centre. The label above it states – Bell of Happiness. Two plaques next to the bell inform about the history associated with it. The bell dates back to 1909 and was used as a nautical instrument on-board the Dar Pormorza – the legendary Polish sailing frigate, considered as one of the most beautiful sailing ship in the world. After sailing across the globe for over 80 years, the bell from the ship was presented as a gift to the Sentosa Islands in 1992. It was later moved to its current resting place at Faber Peak’s Garden Of Happy Promises. It is believed that if a couple rings the bell together, it grants them everlasting happiness, peace and harmony. Even though without a partner, I definitely did not want to miss my chance at happiness so we rang the bell and headed to the bistro for snacks. 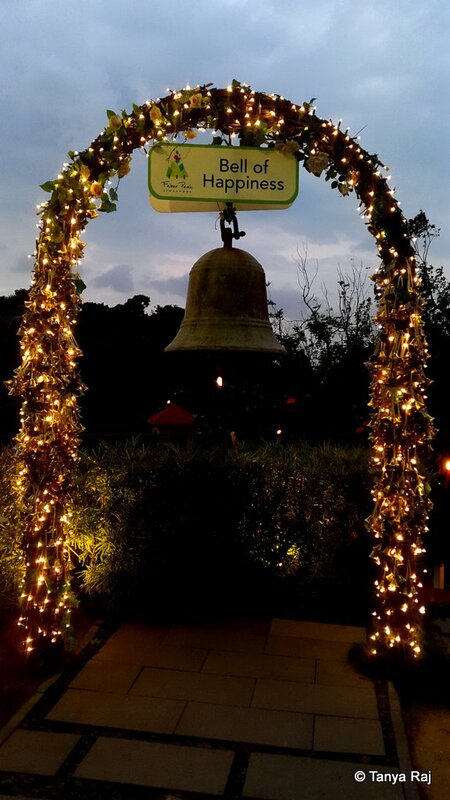 Bell of Happiness – a gift from Dar Pormorza. 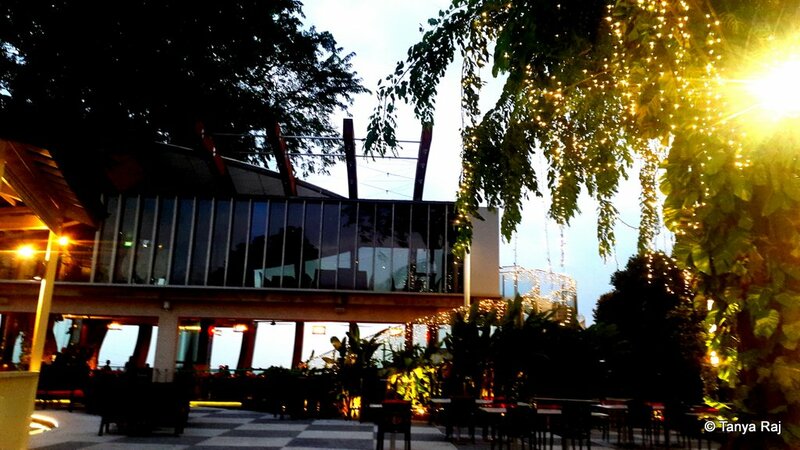 Faber Bistro – the chic cafe at the peak of Mount Faber. The place gives a view of the Sentosa islands and the ocean beyond. The food here is delicious and reasonable. After a quick bite of potato wedges and chocolate fudge, we head back on the trail towards the Henderson Waves Bridge to catch it in its evening light. At about 20 minutes before our starting point, we take a right along the wide metal alphabets spelling out the bridge’s name. 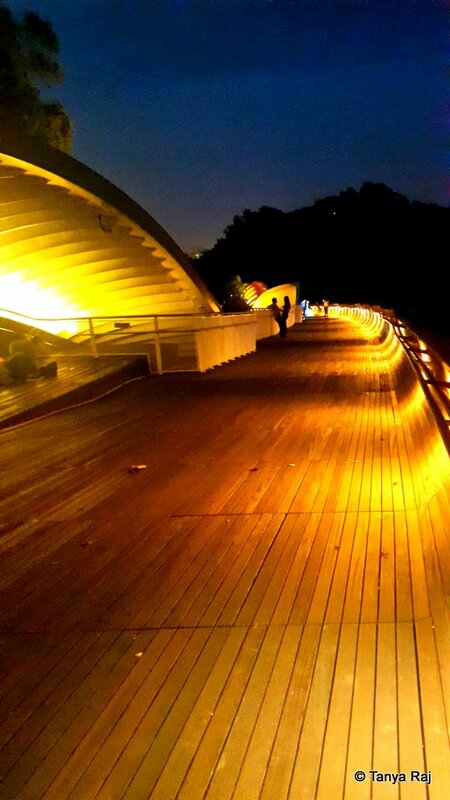 Standing at 36 meters above the Henderson Road, the wooden planked bridge overlooks the city below. It is the highest pedestrian bridge in Singapore connecting Mount Faber Park and Telok Blangah Hill Park. The bridge is a unique pedestrian bridge with seven waves made of curved steel ribs. The ribs alternately rise over and fall under the walking yellow balau wooden deck. The curves over the deck are washed in hues of orange and yellow LED lights. Each concave has elevated seating for the tired hikers or the ones like us who just want to take in the view. A little ahead, a newly married couple – the groom in a black suit and bow-tie and the bride in a flowing light turquoise crocheted gown – are posing for their ‘happily ever after’ moment in front of a camera lens resting on a tripod. The makeup artist is covering the stray hairs on the bride as the photographer gives instructions in Mandarin. At the entrance of the bridge, the wide metal alphabets spell out the bridge’s name. The dusk, brings out the highlights of the bridge’s architecture. After spending a few hours in this entire area, what stayed with me is the peace and tranquillity of the park right in the middle of the city, the winding roads, the fairy lights and some gained perspective. Not every destination will have what I expect, but every destination will have an experience worth travelling for. I left Singapore with the fondest memory because of this place. It was right in the middle of a bustling city that I found my calm, my joy.